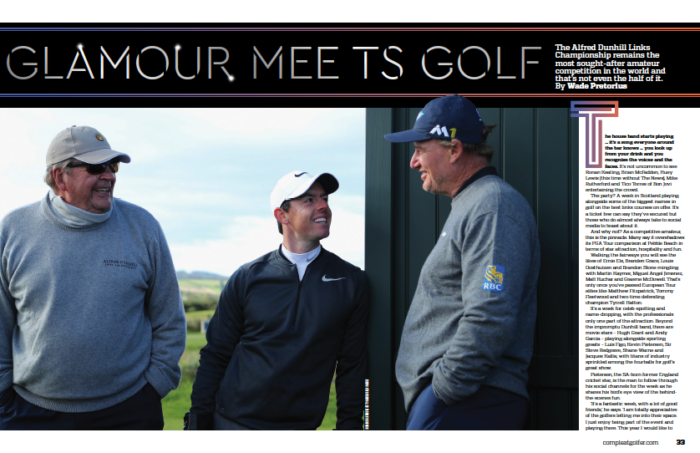 The Alfred Dunhill Links Championship remains the most sought-after amateur competition in the world and that’s not even the half of it, writes WADE PRETORIUS in Compleat Golfer. The house band starts playing … it’s a song everyone around the bar knows … you look up from your drink and you recognise the voices and the faces. It’s not uncommon to see Ronan Keating, Brian McFadden, Huey Lewis (this time without The News), Mike Rutherford and Tico Torres of Bon Jovi entertaining the crowd. The party? A week in Scotland playing alongside some of the biggest names in golf on the best links courses on offer. It’s a ticket few can say they’ve secured but those who do almost always take to social media to boast about it. And why not? As a competitive amateur, this is the pinnacle. Many say it overshadows its PGA Tour comparison at Pebble Beach in terms of star attraction, hospitality and fun. Walking the fairways you will see the likes of Ernie Els, Branden Grace, Louis Oosthuizen and Brandon Stone mingling with Martin Kaymer, Miguel Angel Jimenez, Matt Kuchar and Graeme McDowell. That’s only once you’ve passed European Tour elites like Matthew Fitzpatrick, Tommy Fleetwood and two-time defending champion Tyrrell Hatton. It’s a week for celeb-spotting and name-dropping, with the professionals only one part of the attraction. Beyond the impromptu Dunhill band, there are movie stars – Hugh Grant and Andy Garcia – playing alongside sporting greats – Luis Figo, Kevin Pietersen, Sir Steve Redgrave, Shane Warne and Jacques Kallis, with titans of industry sprinkled among the fourballs for golf’s great show. Pietersen, the SA-born former England cricket star, is the man to follow through his social channels for the week as he shares his bird’s eye view of the behind-the-scenes fun. And while the world gets to enjoy the viewing, there is some South African favouritism, thanks to the event’s founder, Johann Rupert. The billionaire chairman of Alfred Dunhill’s parent company, Richemont, adapted the format to include amateurs alongside professionals in 2001 and hasn’t looked back. A number of spots in the field are allocated to South Africa’s burgeoning talent, who get their taste of a truly global affair. It’s a sporting event that transcends golf as it takes over social media and works its way into the wider sporting, fashion and business media streams. For three days, pros, celebrities and business tycoons make their way around St Andrews, Carnoustie and Kingsbarns before the final round at the home of golf is reserved for the top 60 pros and the leading 20 teams. For all the head-turning talent on display, one professional has seen his game thrive in the company of his celebrity partner. England’s Tyrrell Hatton goes in search of a three-peat and has no problem with crediting Fifty Shades star Jamie Dornan for his calming influence. Hatton has been called every name under the sun as he continues to fight, and lose, the battle to keep his emotions in check, but a week spent chatting to Dornan in between shots has so far proved extremely lucrative. ‘Everyone has their battles, and dealing with frustration is mine,’ says Hatton. ‘But it hasn’t been a problem here and Jamie can take a lot of credit for that. There was a nice moment on the first day when it was really cold by the time we finished. A woman shouted to him: “Over here Jamie, we’ve turned fifty shades of blue waiting for your autograph.” Things like that help keep it fun. The duo are expected to resume their fruitful partnership, with former world No 1 Rory McIlroy even suggesting that Dornan takes up Hatton’s bag on Tour. Hatton’s win in 2017 helped the fiery competitor play his way on to the Ryder Cup team and was all the more impressive as he held off countryman Ross Fisher, who fired a course-record 61 at St Andrews – adding further proof that many of the pros actually thrive with some high-profile company. Fisher finished three back of the winner after turning in a round that will go down as one of the best on Tour, even if the experienced golfer missed a four-footer on the last for yet another birdie. While English stars have taken a liking to the event, there is still one player who craves getting his name on to the trophy. Ernie Els has enjoyed success twice at the Old Course as a winning member of the South African team at the old Dunhill Cup (pre-2001) but the Alfred Dunhill Links title evades him. ‘A win at the home of golf feels very sweet and I was lucky enough to experience that as part of the South African team,’ said “The Big Easy”, who finished second in 2001 and 2003 and claimed third in 2006. ‘It would obviously be nice to have done that in the Alfred Dunhill Links, which is a championship I would 100% love to win. ‘Ever since they introduced this format back in 2001, with pros playing with amateurs, it’s been one of my favourite weeks of the year. Els will not be the only South African desperate for a strong showing, with Grace, now fit again after an injury-enforced stint on the sidelines, and Oosthuizen looking to add another win to their CVs. Both have fond memories, with the former winning the event in 2012 and Oosthuizen, of course, able to rely on his memories from his lone Major triumph in 2010. Their time in the US over the past year yielded little success and they will look to familiar friends and faces for a lift as they seek to end 2018 on a high. Grace remains the only player to have won the Dunhill Links and the Alfred Dunhill Championship, hosted at Rupert’s Leopard Creek. ‘To have won both is special. The links courses and Leopard Creek in South Africa are so different it makes you feel you can win anywhere,’ he says. Grace, the youngest winner of the Dunhill Links at 24, can’t wait for another dart around golf’s most hallowed course. If the more than half a dozen top South Africans fail to light up the leaderboard, simply turn over to the amateur competition where former Springboks Rob Louw and Schalk Burger Snr are always ready to contend. That’s if they aren’t distracted by the likes of Baywatch’s Kelly Rohrbach, Linkin Park’s David Farrell and boxing great Wladimir Klitschko. It is, after all, a week to go celeb-spotting.